The 2011 Fiat 500 will go on sale in less than six months, but the company is still hard at work roadtesting pre-production versions for North America. 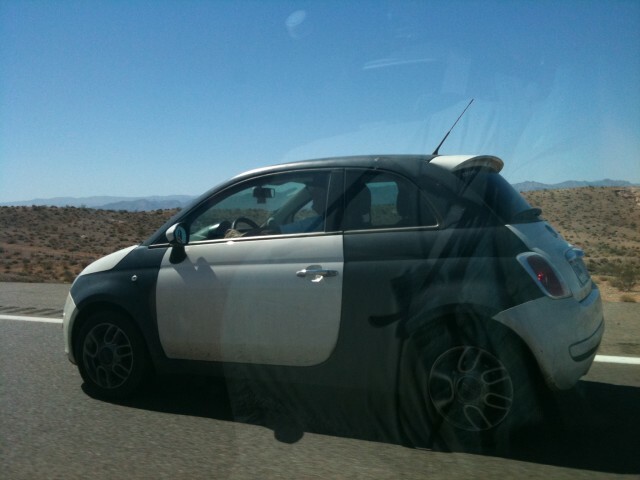 The latest proof is this photo of a Fiat 500 development prototype being road-tested outside Las Vegas, in the hot weather of Nevada. Our reader KJ Elias sent it to us after snapping the photo out the window. According to Elias, the 2011 Fiat was wearing a manufacturer license plate from Michigan (the state only issues one plate per vehicle) and traveling at more than 70 miles per hour. "We saw a small convoy of three 500s on I-15 north of Las Vegas a week ago Saturday," Elias said, "and then two just yesterday while driving south, back to Vegas, along the same stretch." While the 500 for North America is supposed to get quite a few modifications compared to the European version, we don't see any differences in this particular shot. We'll get the standard 500, a three-door hatchback, first, followed by the 500C Cabriolet with a roll-back cloth roof, and the 500 Abarth hot-hatch performance version to follow. There's also a four-door 500 being developed, just for the U.S. market. The 2011 Fiat 500 will compete most directly with the equally small and fun-to-drive 2011 Mini Cooper and Mini Cooper S.
Our thanks to our astute reader for the photo ... and, green-car fans, please note that we welcome all spy photographs you're willing to let us publish!